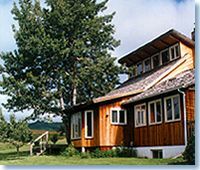 Borderlands Education and Spiritual Center is located on a ranch in the very heart of the heart of the Black Hills of South Dakota, and as such, the land is considered very sacred. 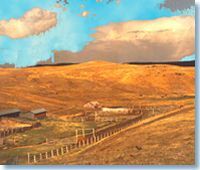 Borderlands Ranch is off the beaten path 16 miles northwest of Hill City near the tiny community of Deerfield. In addition to experiencing the riches the immediate area offers to pilgrims and visitors, especially at the ceremonial grounds, Flag Mountain, Deerfield Lake and the National Forest all around, many sacred and educational sites are reachable during day trips from the ranch. These include Bear Butte, Custer Park, Shrine to Crazy Horse, Journey Museum, Wounded Knee and Devil's Tower. Depending on when you are in residence, it is possible to attend a wacipi (pow-wow), a spiritual ceremony or other cultural and spiritual events. Pilgrimages include many of the things that tourists and vacationers do in the area, the difference being the attitude with which the site or event is approached. A pilgrim attitude brings an awareness of God to everyone and every place encountered. It is an attitude of seeking God in all people, all places and all things and being thankful for all that is encountered. Pilgrims are provided an environment in which to explore what is needed to encounter the Holy -loosely structured time, silence, various forms of prayer and icons or metaphors that invite us into a deeper understanding of the God whom we worship. Prayer is a bookend to each activity, each meal and to each day. Borderlands Ranch is located in the heart of what the Lakota people call the Pe Sla, which has been a spiritual gathering place for the Lakota people as far back as 1000 BC. At the Pe Sla in mid-May in former times when spring had begun, a ceremony called "Peace at a bare spot" welcomed back the many forms of life. This ceremony included feeding the plants by pouring water into the earth and scattering seeds for the birds. Also at this time, people began to prepare themselves for Sun Dance by fasting, silence and purification rituals. After the completion of ceremonies at the Pe Sla, the people journeyed west to collect stones at Inyan Kaga, a sacred hill in Wyoming, and carried them to Mato Tipila or Devil's Tower to be used in the purification lodge during the time of the Sun Dance. The Pe Sla is named Reynolds Prairie on current maps and at 6000 feet above sea level is one of three high prairie areas in the Black Hills. (This information is from the Sinte Gleska University publication, Lakota Star Knowledge by Ronald Goodman.) Following the Sun Dance the journey would move on to Mato Paha or Bear Mountain (or Butte) located on the plains just north of the Black Hills. Everyone is welcome to participate in worship and spiritual ceremonies at Borderlands. Grounded in the Anglican tradition, the worship at Borderlands honors and is inspired by all of creation reflecting particularly several dimensions of the Lakota and Celtic spiritual traditions. The spiritual dimensions of earth, fire, water and wind are explored and experienced by pilgrims. To enrich the spiritual experience of pilgrims, an outdoor eleven-circuit labyrinth has been constructed of local slate and quartz. A medicine wheel, arbor and sweat lodge are also on the property. A century old carriage house with stacked stone walls has ben transformed into a seasonal chapel. Air and Ground Travel: Delta, Northwest and United Airlines all service Rapid City Regional Airport. Lisa at All Continent's Travel -(1-800-334-0697) is very helpful in making flight arrangements. Vehicles and trailers to haul your gear may be rented from Casey's Corner -speak to Dennis at 605-343-2277. Accommodations: Tents, a turn of the century log cabin, and a guest cabin are all used to accommodate pilgrims at Borderlands. The guest cabin has a galley kitchen and two bedrooms, each with a full bathroom, together sleeping up to eight people. The log cabin has bunk beds for six - seven people. If attending ceremonies several days on the reservation, commercial camping facilities are used. More information on the facilities. Meals: Meals are self-catered in the main house kitchen or the barn kitchen. We can provide assistance in menu planning and food purchasing. During day trips meals are carried in coolers or eaten in local restaurants that are generally quite reasonable in price. Laundry: A Laundromat is available in Hill City and Rapid City. Electronics/Technology/Telephone: As building community by focusing on our relationship with God and with one another is a priority of a pilgrimage, there is no television or other technology (other than an occasional videotape) used during a pilgrimage and you are asked not to bring your own (including cell phones andtape and cd walkmans). There is one telephone line at the ranch and pilgrims are asked to use the telephone for emergencies only. Weather: Borderlands is located at an altitude of 6000 ft. so midday can be very warm and evenings very cool. Bring appropriate layers of clothing. Rain showers are common in the mountains. What to bring: Comfortable clothing that can be layered to keep you warm to 40 degrees F (really!) , and cool to 90 degrees; sleeping bag, towel, sturdy walking shoes, a swim suit for the lake, a water bottle, sunscreen, and a sun hat are must haves! You may also enjoy having art materials, a journal, your camera, small musical instruments, binoculars and a light backpack in which to carry everything during day trips. You may prefer or be asked to bring your own tents. A complete list of what to bring is available upon date confirmation. What NOT to bring: Knives, matches, lighters, tobacco products, alcohol, drugs (prescription drugs must be approved by the leaders), weapons of any kinds will not be tolerated at Borderlands. CDs, tapes, recorders or players, radios, and cell phones will be kept safely for you until you go home. What is available: At or near the ranch there is hiking, swimming (lake), croquet, horse-shoes, board games, ping-pong, basketball hoop, badminton, volleyball, a campfire pit, bird watching, cloud and stargazing, porch sitting, chair rocking. Horseback riding, mountain biking and rock climbing are available nearby for their customary fees. Please contact Linda Kramer for more information. Before and After your Pilgrimage: Groups are responsible for any motel arrangements prior to or following a stay at Borderlands. Pre-pilgrimage retreats and orientation, and additional assistance in planning and preparation for your pilgrimage can be provided on a per diem basis by speaking with the Rev. Linda Kramer. Click Here for a list of associated fees for national parks, monuments, and attractions. Click Here to read select comments from past pilgrimage visitors.